UI | H2O: Free, Open Casebooks for all. We’ve been hard at work on H2O, focusing on improving site performance and user experience. Here are some of the improvements we’ve unveiled this summer! General search, playlist creation and dashboard all now have advanced search capability: results can be filtered by item type, creator, or keyword. In addition to advanced search sorting, the user dashboard allows users to set their Print Defaults through My Settings. New playlists can also be tagged with “Primary” to further assist sorting. The annotator tool, used for selecting text to edit (hide, highlight etc.) has been significantly simplified: instead of clicking the first & last word of the section you want to modify, you can now click-and-drag to select the desired text. In addition, item owners (and viewers) now have the option to hide paragraph numbers. We’ve implemented quite a few improvements and fixes, including deactivating the karma bar & heat map which have given H2O a significant performance boost. Note: with the annotator change, the way text was layered changed from word-to-word to a full text selection -this allows the click-and-drag that’s now possible. 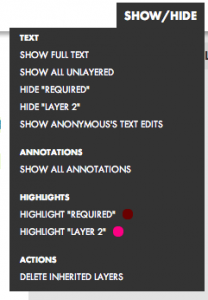 When this change was implemented, it retained all collages’ layers but toggled the state of any that were “on” (i.e., hidden or highlighted) to off. If you have collages from before this summer’s annotator improvement, this may necessitate re-hiding portions of your collages. We’re pleased with progress so far and are excited for what’s in store! We appreciate any suggestions as we continue to work on hard enhancing and improving H2O -reach out to us at h2o at cyber.law.harvard.edu ! To help streamline the process of viewing and interacting with collages on H2O, today we deployed a new feature — the “Show/Hide” button, which replaces the two separate “Text” and “Layers” buttons that used to exist for collages. The “Show/Hide” button is located at the top of each collage. It allows you to decide what text and annotations to view, what layers to highlight, and whether — if you have remixed a preexisting collage with at least one layer — to delete all of the inherited layers. 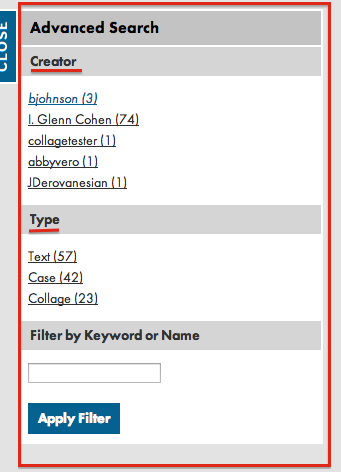 Alongside of this new button, we have also, based on strong user feedback, added a “Required” layer for all collages, so that professors can even more easily and quickly start selecting the text that they want to designate as required. — Select not only if you want to show all of the text of the collage, or just some or all of the layers in the collage, but also whether you want to default to the author’s version of the collage. — Decide whether you want all annotations to be automatically shown, or contracted. — If you remixed a preexisting collage that already had at least one layer, then you will have the option of deleting all inheriting layers in one fell swoop. Erika Wayne — the Deputy Director of the Robert Crown Law Library and a Lecturer in Law at Stanford Law School — has developed a helpful short video guide to using H2O. The video is a great jumping off point for students looking for useful information about how to navigate some of H2O’s basic functionalities. The video is available online here. The most recent H2O User Guide, for reference, is available online here. The H2O team is excited to announce that, as we’ve been foregrounding at the blog for a while, today our developers are deploying our design overhaul to < http://h2odev.law.harvard.edu >. You may notice that the site is a bit slower than usual, or that visual elements are in certain respects quite different than before. Please bare with us while we resolve any issues that may arise — and, indeed, please tell us if there are things that we need to fix by e-mailing us at < h2o at cyber.law.harvard.edu >. All of the functionality should remain intact — and, as we’ll explain in the coming days and weeks, there will be quite a few improvements to the platform, in terms of new features, bug fixes, and the like. Stay tuned. One of the central features of H2O is the ability to edit collages. Collages, for those new to H2O, are what we call edited cases or other texts. 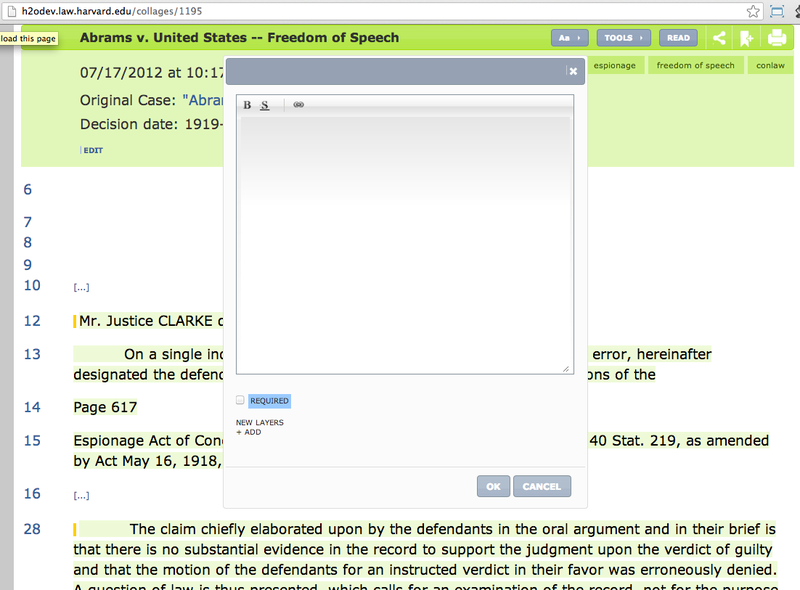 In H2O, users can layer, highlight, and/or annotate portions of a case or other text. Layering, in particular, allows users to decide what part of a text will be displayed by default and, conversely, which parts will be hidden by default—though even hidden text can be read by clicking the ellipses indicating what part of the text has been layered. A key part of the design overhaul of H2O is our attempt to make it easier and more seamless to edit collages. In the current version of H2O, users have to click the beginning and end of the portion of the text they want to edit, and then click through a series of pop-up windows to make their edits. The process is not as intuitive as it could be. 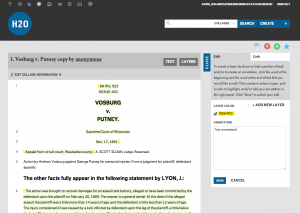 To make it easier for users to edit their cases and other texts, the design overhaul will now allow users to layer, annotate, and highlight their collages with a persistent right side bar. Teachers will no longer have to click through a series of pop-up windows. Instead, they will be able to make multiple its in the side bar without the page needing to reload each edit. The H2O team is in the process of overhauling the site’s look and feel. We want to make it easier for professors and students to use the platform to develop, distribute, and consume course content. We plan to start rolling out the design overhaul in about two weeks, and we will continue to deploy updates throughout the summer. We plan to blog about updates to keep users up to speed on the new functionalities and features. Throughout the fall, winter, and spring, we have received significant feedback on the current beta version of the platform, including from students and faculty who have used H2O at Harvard Law School and from discussions with faculty, librarians, academic technologists, and students at Yale, Columbia, Boston University, and Boston College. Based on this feedback, we focused on six objectives for the overhaul. Below, we provide some information about these six objectives. If you have any feedback or suggestions, please send us an e-mail to h2o (at) cyber.law.harvard.edu. 1. Making it easier to create, curate, and share playlists. 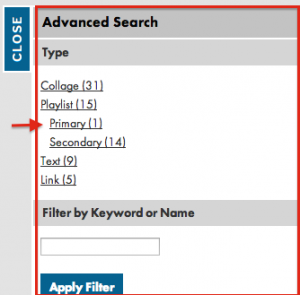 Playlists—which are re-mixable collections of texts, links, images, audio, video, PDFs, and other playlists—form the backbone of H2O. A professor can add another professor’s playlist to her own course content, or re-mix and adapt that same set of content. Drag-and-drop playlist additions. No longer will users have to add items to their playlists through a pop-up window. Rather, they will be able to search for cases and other items they want to add in a search module on a right side bar in the window, and then drag and drop the item into the desired place in their playlist on the left side of the window. Deep clones. Currently, users can remix a playlist but not that playlist’s underlying playlists. Put more technically, the current version of H2O allows users to create a shallow clone of a playlist such that the user can then modify that top-level playlist, but not the elements within the playlist. Professors have told us, however, that it would be very useful to automatically remix the whole playlist, including its underlying elements. So our developers are creating the ability to automatically make what we’re calling a deep clone of a playlist, such that a professor will be able to modify not only the top-level playlist but all of its underlying elements as well. Template for creating a playlist. In the coming months, we plan to deploy an easy-to-use, guided process for professors to create playlists from scratch or by adapting another user’s playlist. Systematizing subjects, categories, course locations, and course time frames. We are also developing the ability for users to identify and search for other playlists not only by key words and dates but also by what subjects and categories pertain to the playlist, as well as where (at what school), when, and by whom a playlist was used in a course. 2. Providing more systematic and visually interesting ways to capture the influence of a user and her content over time. H2O automatically captures when a playlist or collage is remixed, bookmarked, or added to a playlist. The current version of the platform displays some of this information in the “stats” section of the playlist or collage, indicating who did what to the item at what time. We wanted to go beyond this basic display of information to capture information in more systematic and visually interesting ways—in short, we wanted to create a lightweight way to display the relative influence of a playlist and a collage over time. With thoughtful suggestions from Jeff Goldenson—one of our downstairs neighbors in the Harvard Library Innovation Lab—we have developed the prototype of an influence bar code system. H2O will generate a bar code for each playlist, collage, and user. The bar code will display the influence each item and user has had within the H2O ecosystem. The bar codes will be color-coded, with each color tied to a specific influence marker—for instance, a red bar will indicate when a playlist was re-mixed. Bars will be skinnier or wider based on the relative score we have assigned to each influence marker. A relatively more influential indicator, such as when a playlist is added to another playlist, will be proportionally wider than a less influential marker, such as when a playlist is bookmarked. Users will be able to scroll through each item’s and user’s bar code to see what types of influence that item or user has had over time. 3. Continuing to promote and enhance accessibility, including for users with visual and other impairments. The design overhaul of the H2O platform was undertaken with a view toward continuing to promote and enhance accessibility. Over the past two years, the H2O team has consulted with representatives from the Perkins School for the Blind and with the Dean of Students Office at Harvard Law School to identify key concerns and ways to enhance accessibility. Cases, for instance, are ingested into H2O in a way that helps to facilitate the use of a screen-reading program called JAWS. H2O’s developers continue to explore ways to incorporate accessibility principles and guidelines into the platform. 4. Making it easier to create, edit, and share edited texts (aka “collages”). A central feature of H2O is the ability to edit text, such as cases. 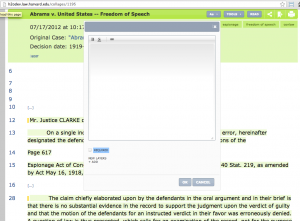 Professors can show or hide, annotate, and highlight word-by-word portions of texts. To make the editing process more seamless, users will soon be able to edit text within the window instead of having to do so one edit at a time through a series of pop-up windows. This enhancement should make it easier and faster for professors to mold their cases and other texts into what they want for their courses. In addition, a new collapsible right sidebar on collages will show information about the collage, including about its history, stats, and author. 5. Giving professors and students more options to customize their experience. With H2O, we have tried to build a lightweight platform with features and functionalities aimed at spurring new approaches to course content development and classroom learning. While maintaining H2O’s lightweight concept, we have also tried to build in a few ways for professors and students to customize their experience of the platform. In the coming weeks, we will deploy a new user dashboard with a “Settings” tab. There, users will be able to select what size of fonts they want to use on the site, as well as which fonts, drawn from a carefully selected collection. In addition, users will be able to fine-tune what types of information and settings they want to print, such as author information, paragraph numbers, titles, and the like. 6. Optimizing H2O for use on multiple devices. We have built H2O so that it can be accessed on any Web-enabled device, such as a desktop, laptop, tablet, or smartphone. As part of the design overhaul, our developers have used “responsive” design, including building more modularity into the platform, so that users will be able to seamlessly access content across devices and across various window widths. The H2O team is working on UI and design enhancements. With these updates, we hope to make it easier and more seamless for professors and students to create and use playlists; to make and revise collages; and to see the influence of their work. We plan to preview the changes on this blog before they’re deployed. We’re hoping to deploy the UI and design enhancements to http://h2odev.law.harvard.edu at the end of the Harvard Law School spring 2013 semester (around the middle of May). If you have any questions or suggestions, let us know by sending an e-mail to h2o [at] cyber [dot] law [dot] harvard [dot] edu!